NEW DELHI: Intex Technologies (India) Chairman and Managing Director Narendra Bansal has been awarded the prestigious ‘Empresario Most Inspiring Entrepreneur Award 2016’ by the National Institute of Industrial Engineering (NITIE), Mumbai for his valuable contribution to the entrepreneurship world. The Award is a salute to leaders who have set exemplary standards, inspired all with their ideas, beliefs, persistence, and unparalleled business acumen. NITIE is one of the Top 10 B-schools in the country and is one of the 15 “Centers of Excellence” identified by Ministry of Human Resource Development (MHRD) along with the IITs, IIMs and IISc. 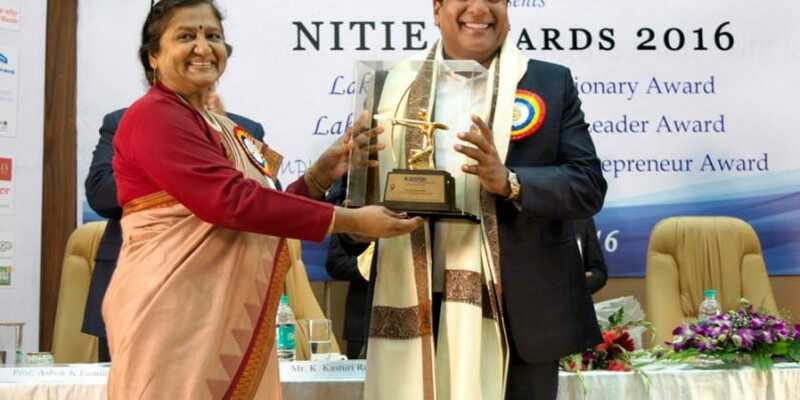 The award felicitation took place at a glittering ceremony at the University Campus in Mumbai and is part of NITIE’s annual event – ‘Avartan’. NITIE- Empresario felicitates eminent entrepreneurs who have had the courage to live their dreams. The award is a memorabilia of achievement to the leaders in the industry, who changed the course of the winds and came out winning. The award was conferred upon Narendra Bansal by Prof (Ms.) Karuna Jain, Director, NITIE. Other eminent personalities also awarded on the occasion were: Rana Kapoor, Founder, Yes Bank was given the Lakshya Business Visionary Award and K. Kasturirangan, Former Chairman of ISRO and Dr. Vijay Bhatkar, Inventor of India’s first Supercomputer were awarded the Lakshya Distinguished Leadership Awards. Empresario, supported by TiE & NEN, is a forum that aims at promoting entrepreneurship and provides a support network for the aspirants, through productive interaction with successful entrepreneurs and entrepreneurial bodies. Intex CMD bags ‘Empresario Most Inspiring Entrepreneur Award 2016’ 3 out of 5 based on 1 ratings. 1 user reviews.